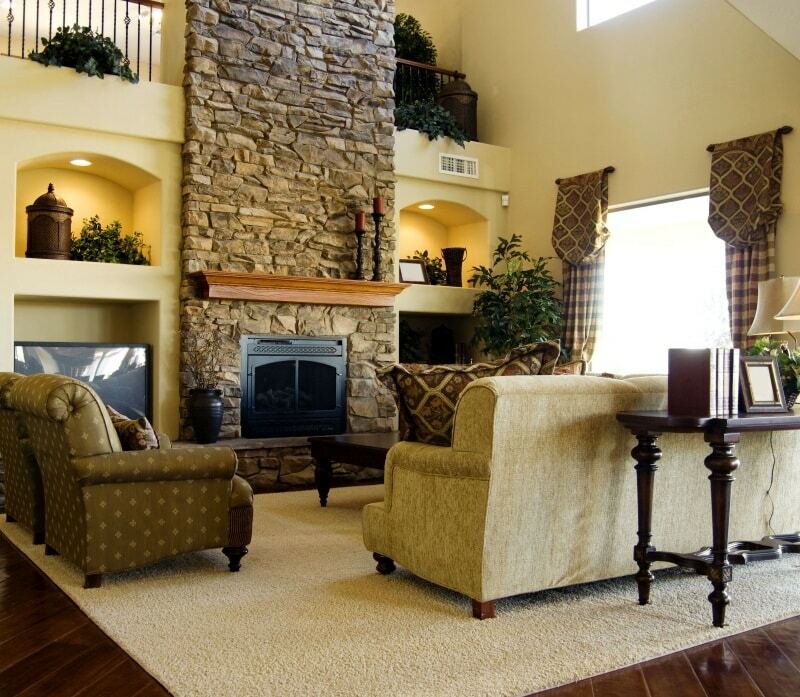 Bonjour and welcome to our Art of the Home photo gallery of living rooms with hardwood floors. We hand picked them for you…hope you enjoy the visit! Hardwood flooring offers a naturally beautiful canvas on which you can start drawing your dream living room. You may think that living rooms with hardwood floors are not as comfortable as living rooms with carpets…especially if you enjoy walking barefoot in your house in the winter or like to play around on the floor with the children. But they can be as cozy by simply adding an area rug — and voilà, you get the best of both worlds! You will see from the nine pics of living rooms with hardwood floors below; there are so many hardwood floor patterns and types of wood to choose from. These selected living rooms with hardwood floors also feature different styles (e.g. large distressed planks, narrow strips, etc.) and wood stains (e.g. white wash, Provincial, etc.). So if you are thinking about adding hardwood flooring to your living room, or are thinking about refreshing the look of the hardwood floor you already have or simply looking for beautiful déco ideas for your living room, check out these beautiful photos of living rooms with hardwood floors for some good old fashion inspiration…it’s free to browse! Enjoy and beautiful day to you! The Little Plus: the multiple square tray ceiling with spots to add targeted lighting — very clever! And of course the French doors and wall windows with arched transoms — as beautiful as it is practical to naturally light this living room. 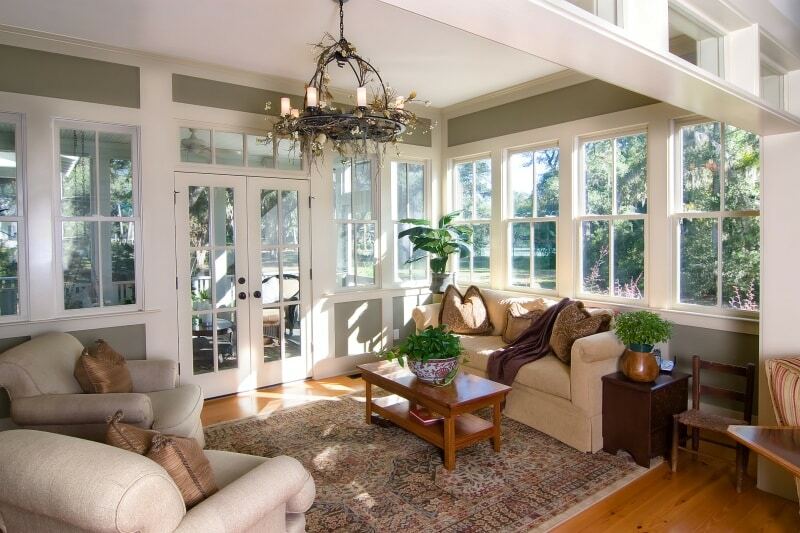 And did you notice the adjacent spacious sunroom — you can never have enough sunshine! The Little Plus: the tons of natural light thanks to French doors and all around large double-hung windows. And look at the adorable provincial baby straw chair in the corner — it is not uncommon to find these in French homes. The Little Plus: the high ceiling stone wall with cast iron fireplace insert. Also, the maple hardwood floors are gorgeous. 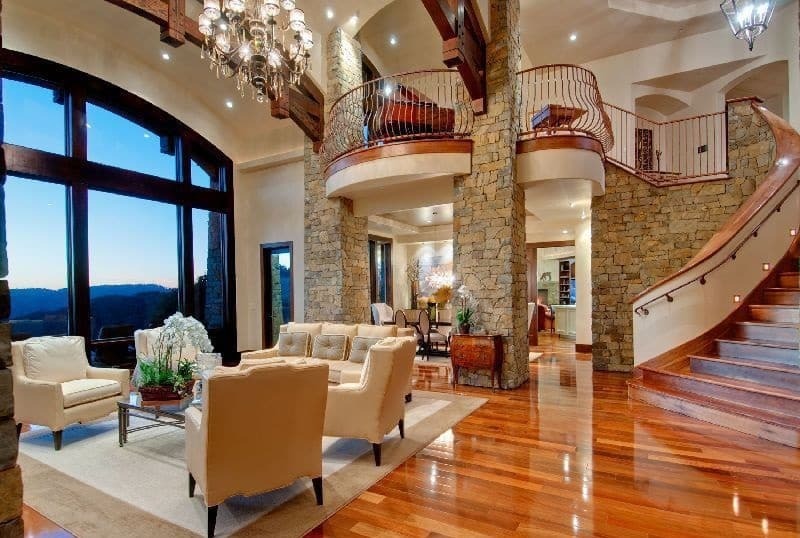 They add class and warmth to this spacious living room. The Little Plus: the full-length arched bow windows add some flare and plenty of natural light. And notice the treasures from travels around the world on display. They are perfect conversation pieces and add color, in reality, and spirit, to this modern living room.